Hip lifts – Also known as hip presses or hip thrusts are an efficient and effective exercise you can do anywhere. Hip lifts works several different muscle groups, but mainly the hamstrings and the glutes. Take a look at some of these hip lifts variations in the video below for example. A Hip Press is simply where you lay on the ground in a supine position, and face the ceiling. Using your heels to guide you, bridge your hips and press into the air. Now while you can do this with or without a resistance band, or a barbell using one of these options may increase the difficulty and overload. It will usually increase the intensity of your workout, thus help you potentially build muscle faster. The Kneeling Band Hip Press differs from the rest, it focuses more on the glutes and less on the hamstrings. 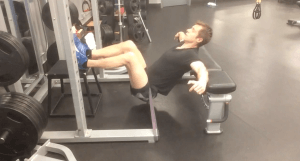 Although the main difference is simply the position that you do the hip press in. Adopting this kneeling position eliminates the hamstrings and targets the glutes. 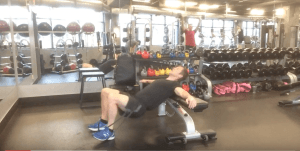 The Elevated Hip Press allows for more mobility and depth than compared to the others. 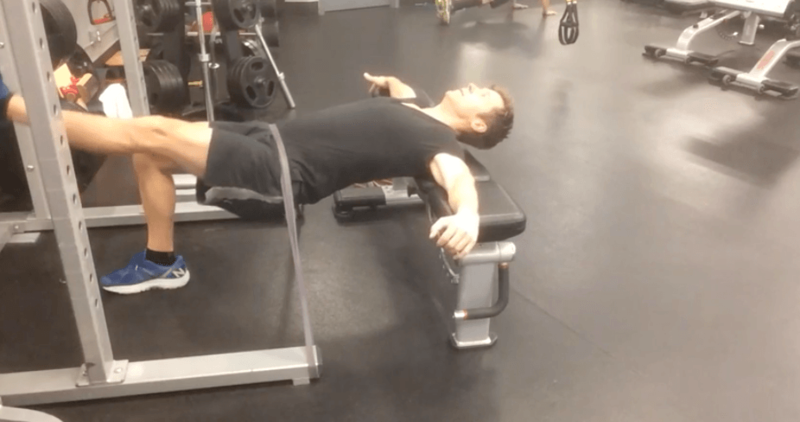 To do this hip press, lay with your legs a few feet off the ground on a bench. This allows your hips to move through a deeper range of motion, subsequently targeting more muscle fibres and growth. Can we get it a little more intense? 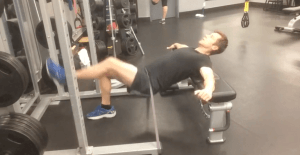 The Single Leg Hip lift has to be one of the most challenging of all! This unilateral exercise is similar to a regular hip lift, but one of your legs is raised in the air. So no pressure there! This variation is great for identifying muscle imbalances as well as working the core, lower back and of course glutes/hamstrings. You may wonder what the benefits include ? We know the glutes are the largest muscle group in the body ? Thats correct! Strengthening the glutes will prevent and reduce lower back pain and in fact knee pain incidentally as an added benefit. Glute activation prior to workouts get them “Ready” to perform, bridges, squats, lunges etc – thus reducing the risks of injury. The hip stabilizers play an important role everyday biomechanical movement functions such as walking, running, squatting and deadlifting. Activating and strengthening our glutes in the frontal plane, as well as the sagittal plane will complement the activities above, in addition to improving our upright posture and alignment. The gluteus medius helps stabilize the hips – Try some lateral band walks to hit these muscles. Also, guess what will make hip thrusts more intense? Using a barbell combined with resistance bands will increase the intensity even more! This unique combination offers the ascending resistance of the bands, plus the dead weight of the barbell – Remember to use a spotter while you do this. If you want to try a supine plank for posterior chain recruitment, consider the Hip Press Hold. All you have to do is press up like one would during a normal hip press. Then hold it there in an isometric position for 30 seconds to up to 2 minutes. Doing this keeps the muscles working at full hip extension, when the band is stretched to the maximum. You are probably thinking “should I do these often?” and the answer would be “Yes,” why not attempt these workouts several times a week, depending on the intensity and fitness levels your comfortable with. So work hard, and you’ll soon reap the benefits. Below are some cues to guide you when performing the 8 exercises in the video. Attach band around both feet and across hips. Drive heels into ground, press hips upwards. Set up band body attachment as per last exercises. Squeeze glutes, drive hips upwards. Band Plus Barbell Hip Press.